Many of you will be aware of an incident where a pony died of natural causes in Four Marks last week. We’d like to thank animal owners for being vigilant following this and thought it was an appropriate opportunity to offer some general crime prevention advice, especially if you own a horse. The coming weeks will see the evenings drawing in, particularly now that the clocks have gone back. This serves as a timely reminder to review your security in terms of where you keep your horse and equipment. Be aware of strangers around the yard or field and politely challenge them if you feel safe to do so. We rely heavily on members of the equine community to remain alert and to tell us of anything that appears to be suspicious. Being informed helps us to build a picture of what is going on in the community. Any information, regardless of how insignificant it may seem to you, helps us to complete the jigsaw. If you need to call us, please ensure that you know the address and postcode so we can find you easily. Are there any landmarks that may help us get to your location? Keep a pen and paper in the stables and in your vehicle so you can make a note of anything rather than relying on your memory. When possible, use coach bolts to secure fixings. These are like screws but they are tightened from the inside of the building and have flat heads. Quite often you can have the best padlock but it is securing a latch that has been screwed in. This means that someone with a screwdriver could just undo the screws to gain access. Check around the hinges to ensure that there is no rotting wood. Check doors are sturdy and secure, and cannot easily be forced. 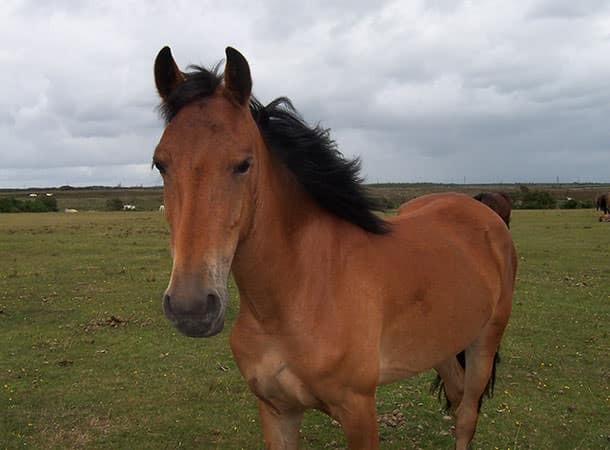 Horse theft is extremely rare in Hampshire and the Isle of Wight. Horse thieves can be deterred if your animal is easily identifiable, and there are several different brands of marking; freeze marking, micro chipping, Hoof branding and DNA Analysis. If you do this, it’s also worthwhile advertising the fact your horse is marked on the outside of the stable. Please ensure that you have clear photographs (from all angles and particular markings) of your horse in Winter and Summer. Ensure that your horse passport is up to date and accurate. Keep hedges well maintained and minimise places where access can be gained. Thieves will often try to access via adjoining land using 4×4 vehicles. Items stolen can be subsequently hidden in bushes and hedges to be later collected. Make sure you have good visibility around your fields and yards. Make a note of who has keys and keep any access points well maintained. If you are going to be in the field or yard for a while, don’t leave the key in padlock. Always take it with you. Please ensure that your tack is suitably marked. Saddles and bridles are easily marked with equipment that can be borrowed from the Country Watch team. Rugs can be marked with your postcode written in permanent ink or painted onto the side. This will act as a deterrent to a thief, and will also make your property identifiable should it be stolen. If you require further security advice, or a site visit where security advice can be provided, please contact Country Watch on 101.